A spooky horror story that will leave you wondering what happened. Insomnia had taken over my body and mind, and had forced me not to sleep. I sat down near my huge window, looking out at the pale-faced moon. The winter night was serene, yet ominous. The streets were empty, and the streetlights were dim. It had been quite cold today, and the night was icy; ready to trap anyone in a huge blizzard of icy winds. I could just watch the moon from my window and wait for sleep to fall over me. The chill of the night kept me awake, I thought of reading and took out my book, titled ‘500 Most Horrid Horror Stories’ It was an old trick. Whenever I couldn’t sleep, I used to read this book. Many times this book had helped me fall into deep slumber. I opened it. Suddenly, a strong gush of icy winds swept passed the window, shivered me and flipped the pages of the book until it stopped at a story titled, ‘Death’s Mask’. “Strange!” I said. Anyways, I began to read it. It was quite a horror story. It said that a devil came at night in a small town to abduct young girls away to hell, kill them, eat their flesh and leave their bones on their beds. How sexist! I feel that it’s wrong to target womenfolk in such a way. Have you ever heard a devil or ghost targeting a man first? Even the vampires targeted the women the most. “Ridiculous!” Was all I could say! I closed the book, switched off the lamp and pulled over my blankets to have some sleep. At around 2:30pm, I suddenly woke up. I could hear heavy footsteps. I thought that it must be father, but I was not sure. So I decided to check it out. I went out to the kitchen, from where, I could hear some voices. I switched on the lights. Fortunately, there was no one, but it was icy cold, I thought that I would freeze! Just as I was about to leave, I saw a shadow, just along the dining table. I went closer. I thought it was just a vision trick that darkness and icy numbness were doing to me. As I went closer, I saw a human figure, completely shadowed by a pitch black robe, with a hood over its face. I didn’t know that who or what it was. As I went closer to it, it vanished! I saw that shadow again. This time it was on the stairs, floating above the ground!? In order to satisfy my curiosity about this strange thing, I decided to follow it. I realized that my surroundings have been dramatically changed. I found myself, no longer near the stairs, but on my terrace! I had lost control of my will. My body was moving, but against my will. I saw that mysterious figure again. This time it was signaling me to move forward, and to my surprise, I did moved! I was dangerously near to the iron railings of my terrace and I suspected a possible attempt of murder; my murder! I stood there for a while before obeying to the shadow, analyzing and trying to grasp what was happening. I was feeling drowsy, as if I had been wakened from mid-sleep. As I was thinking, the shadow signaled me to jump! I tried to shout, but all in vain, my body was not under my control. In an impulse, I jumped. As I fell I saw the shadowy figure. I felt as if the devilish creature was elated and pleased to see me fall. I couldn’t stop my tears. I was overwhelmed by last thoughts. I was sure that this was the end. No, I must be dreaming. Still, somehow I knew that I wasn’t dreaming. I bid my dear ones goodbye for the last time and fell to the ground with a dull thud. As I opened my eyes, I saw a bluish-whitish ceiling of a small room. I got up. I saw my mother, father and sister. My mother was crying and smiling at the same time, my father was happy to see me finally awake, and my sister was just overjoyed. I couldn’t believe what my mother told me. I asked her how I came to be at the hospital and what had happened. She told me that I had been comatose for almost a week. My condition was critical, and no one knew what had happened. She told me that either I had been sleepwalking or I had tried to commit suicide. She told me that our watchman had seen me fall that night, so he woke them and they rushed me to the hospital. She told me that if I had arrived at the hospital any later, then I would surely have died. So, what happened on that day? Had I been sleepwalking, or had whatever happened been real? Had I been dreaming, or had I really fought and finally won against Death’s Shadow? If you enjoyed reading this story, please let me know! Authors thrive by the feedback they receive from readers. It's easy: just click on the email link at the bottom of this page to send me a message. Say “Hi” and tell me what you think about ‘Death's Shadow’. Thanks. 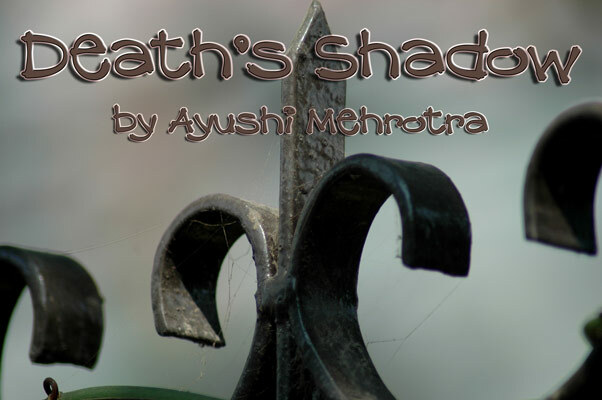 This story is Copyright © 2013 by Ayushi Mehrotra. It cannot be reproduced without express written consent. Codey's World web site has written permission to publish this story. No other rights are granted. Disclaimer: All publicly recognizable characters, settings, etc. are the property of their respective owners. The original characters and plot are the property of the author. The author is in no way associated with the owners, creators, or producers of any media franchise. No copyright infringement is intended. The original image is Copyright © KayPat | stock.xchng.